An ideal addition to our range of digital signage computers. 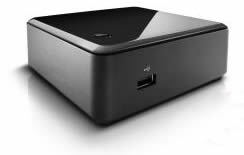 The Intel® Next Unit of Computing (NUC) is a mini computer that works extremely well with the Navori digital signage software. For such a tiny unit, the NUC produces a high performance quality result with ease. Intel® Desktop Boards – Next Unit of Computing (NUC) family delivers stunning visuals and edge-of-your-seat performance in an ultra-small package. Powered by a visibly smart 3rd generation Intel® Core™ i3 processor on a 10cm x 10xm motherboard and enclosed in a tiny case, the NUC is big on performance yet surprisingly small in size. It’s an ideal engine for digital signage, kiosks, home theater systems, and intelligent devices for small spaces, or anywhere else you can imagine. What’s more amazing is that such a small a device can offer so much power in a flexible, customizable package. Wirelessly stream to other devices in the home or office. Experience your movies, photos, and games smoothly and seamlessly. Effortlessly move between applications with smart multitasking delivered by Intel® Hyper-Threading Technology. Dramatically increase data transfer rates and daisy-chain peripherals with Thunderbolt™ technology. Get a difference in performance you can truly see and feel. The NUC features a visibly smart Intel® Core™ i3 processor in a highly customizable package. It’s a breakthrough in compact but impactful computing. Drive two digital displays at once with dual HDMI. Get reliable connectivity through Gigabit LAN. And effortlessly move between applications with smart multitasking delivered by Intel® Hyper-Threading Technology. With this kind of capability and size, you’ll rethink what’s possible. Because the only thing more amazing than Intel® technology is what you’ll do with it. Imagine a computing device powerful enough to produce stunning visuals with responsive performance. Yet small enough to drive digital signage, kiosks, or other applications demanding performance in a tight space. We did. The result is the Intel® Next Unit of Computing (NUC). With a visibly smart Intel® Core™ i3 processor in a highly customizable package, the NUC is a breakthrough in compact but impactful computing. Drive two digital displays at once with dual HDMI. Get reliable connectivity through Gigabit LAN. Effortlessly move between applications with smart multitasking delivered by Intel® Hyper-Threading Technology. The Intel® Next Unit of Computing (NUC) Kit DC3217BY delivers stunning visuals and responsive performance in a pocket-sized solution. With a visibly smart Intel® Core™ i3 processor, the NUC is a fully-scalable and complete unit of computing using the smallest possible form factor. What's more amazing is that such a small device can offer so much power in a flexible, customizable package. Experience your movies, photos, and games smoothly and seamlessly. Effortlessly move between applications with smart multitasking delivered by Intel® Hyper-Threading Technology. Dramatically increase data transfer rates and daisy-chain peripherals with Thunderbolt™ technology. Get a difference in performance you can truly see and feel.